A friend of mine suggested at lunch that the money spent on the war in Iraq might buy a lot of solar panels. So how many solar panels would $307 billion (at the time of this writing) buy? My 5 kilowatt system, installed, with inverters and mounting, cost about $50,000 before government rebates. At that cost, we get 6,145,956 houses powered by solar energy. And another house gets solar for every 50 seconds the war continues (call it a house per minute). The rule of thumb is that a house gets 6 hours a day of usable sun, so 6,145,956 * 5 kilowatts * 6 hours is 184,378,680 kilowatt hours per day. 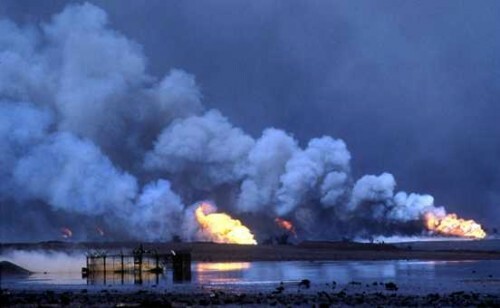 Prior to Iraq’s invasion of Kuwait, Iraq was producing 3.5 million barrels of oil per day. In December of 2002, the U.S. imported 11.3 million barrels of oil from Iraq. One barrel of crude oil is equal to about 1700 kilowatt hours of electricity. So Iraq was producing the equivalent of about 6 billion kilowatt hours per day. The U.S. was importing the equivalent of 620 million kilowatt hours from Iraq per day. So, if we built solar panels with the money, we would get more than a third of the energy that Iraq supplied per day, but from the sun instead of from oil. If we continued to spend at that rate for another two wars worth of time, we would more than break even. Now this is assuming that there are no economies of scale to be had from spending $307 billion on putting up solar panels. If there were only a factor of 3.37 in our favor, we could have effectively bought the energy equivalent of all the oil in Iraq for the cost of one war. And, yes, the efficiency of producing electricity from oil is not 100%, (more like 40%), and there are transmission losses in the grid that you don’t have when each house is producing its own electricity, so we get our factor of 3 right there. Joseph Stiglitz (former chief economist at the World Bank) estimates that the cost of the war on the U.S. economy is between $1 trillion and $2 trillion. Now those solar panels are looking really cheap. So don’t blame the president’s decision to invade Iraq on the need for oil. He’d have to be stupid to have done that.